A man who fled a traffic stop in Barnstable and dove into a pond to hide from police Monday evening was caught using a drone equipped with an infrared camera, Barnstable police said. Police originally attempted to stop a vehicle driven by Angel Robinson III, 24, of Yarmouth, for “multiple motor vehicle infractions” around 6:33 p.m. Monday in Hyannis, police said. An officer first noticed Robinson driving his vehicle without license plates, and without a muffler, Barnstable police Sergeant Sean Sweeney said. Robinson refused to immediately pull over, and drove into the Cape Cod Mall parking lot. The officer attempting to stop Robinson also saw the suspect reach for the glove box area of his vehicle, police said. “[The officer] could see him bobbing in the car, leaning over toward the glove box,” Sweeney said. Robinson eventually stopped near Macy’s at the mall, and when the officer went to inspect his car, Robinson fled his vehicle into a wooded area and dove into a pond. Officers then found a loaded 9mm firearm along with “a large amount of cash and a small amount of narcotics” in Robinson’s vehicle, police said. “The officer kept saying to himself, ‘What is he doing in the glovebox?’” while following Robinson, Sweeney said. Robinson would likely have only been given a warning for the vehicle violations if he hadn’t acted suspciously and tried to run, Sweeney said. Officers then proceeded to surround the pond Robinson had jumped into, and the Barnstable police department drone was brought on scene. The drone was recently donated by the community police support group, Bluecoats, that has given the department various high-tech equipment, training, and facilities. “It’s made up of people from town, and it’s a great support group for the police department,” Sweeney said. The new drone is equipped with a Forward Looking Infrared camera, which allows it to pick up heat signatures, and has previously been used in missing persons cases, Sweeney said. The drone completed a grid search of the pond and found a heat signature — Robinson — coming from the edge of the water. Robinson was “fully submerged with just his head sticking out of the water along the densely wooded area at the water’s edge,” police said. “The brush was so thick you couldn’t even see him,” Sweeney said. Officers then closed in on Robinson’s location with K-9 units and the drone and took him into custody without incident. 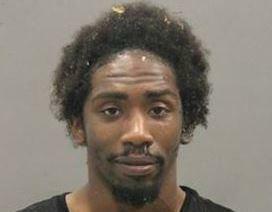 Angel Robinson III, 24, of Yarmouth, was arrested for resisting arrest and gun and motor vehicle charges Monday. Robinson was charged with operating a motor vehicle with unnecessary noise, operating without number plates, failure to stop for a police officer, unlawful carrying of a firearm, carrying a loaded firearm, resisting arrest, and unlawful possession of ammunition.